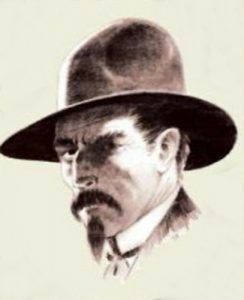 Late in the Autumn of the same year, 1878, and also at or near the stage-crossing of Old Woman’s Fork, Boone and one companion fought eight bandits led by a man named Frank Towle, on whose head was a large reward. This was earned by Boone at a hold-up of a Union Pacific Express Train near Green River. This band was, in a way, more lucky, for five of the eight escaped; but of the three otherwise engaged one furnished a head which Boone toted in a gunny sack to Cheyenne and exchanged for five thousand dollars, if my memory rightly serves. This incident was practically the last of the serious hold-ups on the Cheyenne Road. A few pikers followed and “stood up” a coach occasionally, but the strong organized bands were extinct. 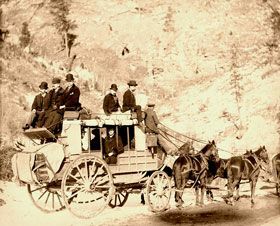 Throughout 1879, Boone’s activities were transferred to the Sidney-Deadwood Road, where for several months before Boone’s coming, Curley Grimes and Lame Johnny had held sway. Lame Johnny was shortly thereafter captured, and hanged on the lone tree that gave the Big Cottonwood Creek its name. A few months later, Curley was captured by Boone and another, but was never jailed or tried. However, when nearing Deadwood, he tried to escape from Boone, and failed. With the Sioux pushed back within the lines of their new reservation in South Dakota and semi-pacified, and with the Sidney Road swept clean of road-agents, life in Boone’s old haunts became for him too tame. Thus it happened that, while trapping was then no better within than without the Sioux reservation, the Winter of 1879-80 found Boone and four mates camped on the Cheyenne River below the mouth of Elk Creek, well within the reserve, trapping the main stream and its tributaries. For a month they were undisturbed, and a goodly store of fur was fast accumulating. Then one fine morning, while breakfast was cooking, out from the cover of an adjacent hill and down upon them charged a Sioux war party, 150 strong. Boone’s four mates barely had time to take cover below the hard-by river bank — under Boone’s orders — before fire opened. Down straight upon them the Sioux charged in solid mass, heels kicking and quirts pounding their split-eared ponies, until, having come within a hundred yards, the mass broke into single file and raced past the camp, each warrior lying along the off side of his pony and firing beneath its neck–the usual but utterly stupid and suicidal Sioux tactics, for accurate fire under such conditions is of course impossible. Meantime, Boone stood quietly by the camp-fire, entirely in the open, coolly potting the enemy as regularly and surely as a master wing-shot thinning a flight of ducks. Three times they so charged and Boone so received them, pouring into them a steady, deadly fire out of his Winchester and two pistols. And when, after the third charge, the war party drew off for good, forty-odd ponies and twenty-odd warriors lay upon the plain, stark evidence of Boone’s wonderful nerve and marksmanship. Shortly after the fight one of his mates told me that while he and three others were doing their best, there was no doubt that nearly all the dead fell before Boone’s fire. A type diametrically opposite to that of the debonair Boone May was Captain Jim Smith, one of the best peace officers the frontier ever knew. Of Captain Smith’s early history nothing was known, except that he had served with great credit as a captain of artillery in the Union Army. He first appeared on the United Pacific during construction days in the late sixties. Serving in various capacities as railroad detective, marshal, stock inspector, and the like, for eighteen years Captain Smith wrote more red history with his pistol (barring May’s work on the Sioux) than any two men of his time. The last I knew of him he had enough dead outlaws to his credit — thirty-odd — to start, if not a respectable, at least, a fair-sized graveyard. Captain Jim’s mere look was almost enough to still the heart-beat and paralyze the pistol hand of any but the wildest of them all. His great burning black eyes, glowering deadly menace from cavernous sockets of extraordinary depth, were set in a colossal grim face; his straight, thin-lipped mouth never showed teeth; his heavy, tight-curling black moustache and stiff black imperial always had the appearance of holding the under lip closely glued to the upper. In years of intimacy, I never once saw on his lips the faintest hint of a smile. He had tremendous breadth of shoulders and depth of chest; he was big-boned, lean-loined, quick and furtive of movement as a panther. In short, Captain Jim was altogether the most fearsome-looking man I ever saw, the very incarnation of a relentless, inexorable, indomitable, avenging Nemesis. Like most men lacking humor, Captain Jim was devoid of vices; like all men lacking sentiment, he cultivated no intimacies. Throughout those years loved nothing, animate or inanimate, but his guns — the full length “45” that nestled in its breast scabbard next his heart, and the short “45,” sawed off two inches in front of the cylinder, that he always carried in a deep side-pocket of his long sack coat. This was often a much patched pocket, for Jim was a notable economist of time, and usually fired from within the pocket. That he loved those guns I know, for often have I seen him fondle them as tenderly as a mother her first-born. In 1879 Sidney, Nebraska was a hell-hole, filled with the most desperate toughs come to prey upon overland travelers to and from the Black Hills. Of these toughs McCarthy, proprietor of the biggest saloon and gambling-house in town, was the leading spirit and boss. Nightly, men who would not gamble were drugged or slugged or leaded. Town marshals came and went — either feet first or on a keen run. So long as its property remained unmolested the Union Pacific management did not mind. But one night the depot was robbed of sixty thousand dollars in gold bullion. Of course, this was the work of the local gang. Then the Union Pacific. got busy. Pete Shelby summoned Captain Jim to Omaha and committed the Sidney situation to his charge. Frequenting haunts where he knew the news would be wired to Sidney, Jim casually mentioned that he was going out there to clean out the town, and purposed killing McCarthy on sight. This he rightly judged would stampede, or throw a chill into, many of the pikers — and simplify his task. Arrived in Sidney, Jim found McCarthy absent, at North Platte, due to return the next day. Coming to the station the next morning, Jim found the express reported three hours late, and returned to his room in the railway House, fifty yards north of the depot. He doffed his coat, shoulder scabbard, and boots, and lay down, shortly falling into a doze that nearly cost him his life. Most inconsiderately the train made up nearly an hour of its lost time. Jim’s awakening was sudden, but not soon enough. Before he had time to rise at the sound of the softly opening door, McCarthy was over him with a pistol at his head.